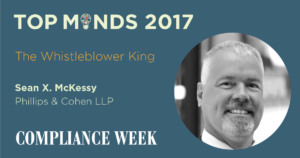 As the former Chief of the Securities and Exchange Commission Whistleblower Office, Sean McKessy provides singular insight and unparalleled knowledge of the SEC whistleblower program in his work with clients as a partner at Phillips & Cohen. Mr. McKessy was the first Chief of the SEC Whistleblower Office and helped establish the processes the office follows and the policies that guide the SEC whistleblower program. His office assessed and reviewed whistleblower tips, evaluated whistleblower award claims and made whistleblower award recommendations to the Commission. During his five-year tenure, he was a tireless advocate for whistleblowers and an outspoken proponent of the SEC program. He played a key role in the SEC’s efforts to protect whistleblowers using Dodd-Frank’s anti-retaliation provisions and to punish employers that discouraged employees from reporting wrongdoing to the SEC through employment agreements and other means. Mr. McKessy also actively encouraged whistleblowers in other countries who knew of violations of the US anti-bribery law, the Foreign Corrupt Practices Act, as well as other securities violations to report them to the SEC and file whistleblower claims. Under his leadership, the SEC Whistleblower Office was authorized by the Commission to pay whistleblower awards totaling nearly $100 million – a record-setting pace for a government whistleblower reward program. The SEC recovered more than $500 million in sanctions as a result of the whistleblowers’ information and assistance. In a previous stint at the SEC, he was a senior counsel in the Enforcement Division for three years. After leaving that position, Mr. McKessy served as corporate secretary for Altria Group Inc. and AOL Inc. and as securities counsel for Caterpillar Inc. He worked on internal compliance and reporting matters related to federal securities laws for those companies. Mr. McKessy received his law degree from the George Washington University Law School. He is admitted to the bar in Virginia, Illinois and Washington, DC. I feel I've established that I honor the work whistleblowers do. I am hoping to convince many people who are on the fence witnessing fraud to come forward.